Hans Joosten studied biology and worked as researcher and policy officer in the Netherlands. Since 1996 he leads the Department of Peatland Studies and Palaeoecology of Greifswald University (Germany), since 2008 as an Extraordinary Professor. A key topic of his research group is the development of paludiculture (a term he coined in 1998). In 2016 he, together with Wendelin Wichtmann and Christian Schröder, edited the first textbook about paludiculture. 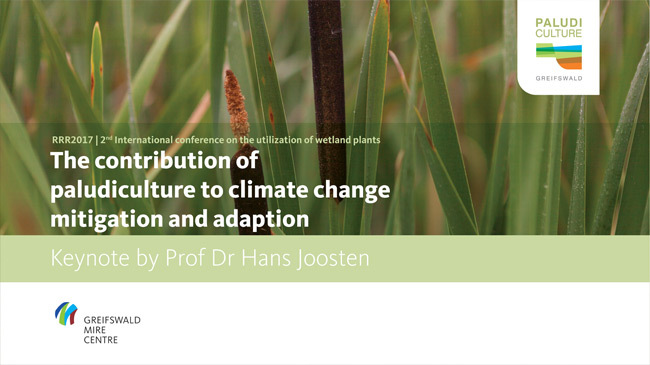 Hans Joosten is Secretary-General of the International Mire Conservation Group and since 2009 intensively involved in UNFCCC and IPCC, especially with respect to emissions from organic soils, and in FAO in advancing climate-responsible peatland management. In 2013 he was awarded the European CULTURA Prize for Sustainable Land Use, and the German Federal Research Award Sustainability for his project Vorpommern Initiative Paludiculture. Globally, drained peatlands are responsible for 5% of all anthropogenic greenhouse gas emissions. In 50 countries drained peatlands emit > 10 %, in 25 countries even > 50 % compared to national emissions from fossil fuels and cement. Therefore, peatlands must play a major role in reaching the targets of the Paris Agreement. The root cause of peatland emissions lies in agriculture, which had its cradle in steppes and semi-deserts and consequently transforms mires into dry landscapes. The results are everywhere the same: gigantic greenhouse gas emissions and other forms of severe environmental damage. Sustainable utilisation of peatlands appears only to be possible under wet conditions. Paludiculture aims at reducing drainage-induced emissions, preserving the peat body as a sustainable base of production, while generating marketable products. The keynote gives an overview of climate change mitigation and adaptation perspectives in various parts of the world, discusses legal, political, and economic obstacles and challenges, and presents a way forward for the implementation of paludiculture as an important climate change mitigation and adaptation strategy.